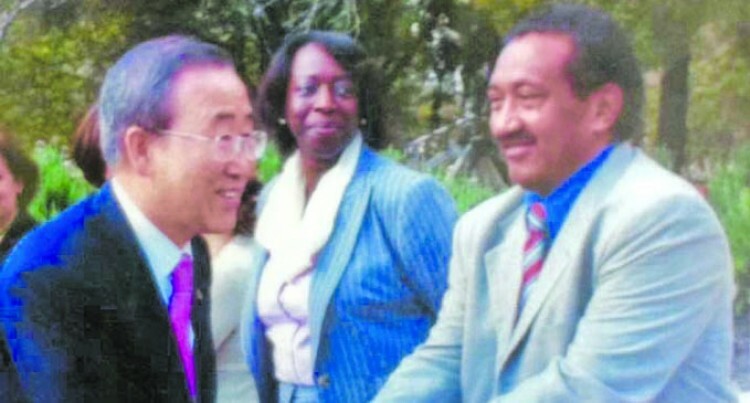 Fiji’s first peacekeeper Saula Raiyawa (right) meeting the former UN Secretary-General Ban Ki-moon. Poppy Day is this Sunday. Wreaths will be laid at the newly-renovated National War Memorial to solemnly remember those that gave the ultimate sacrifice for their nation. In this 40th Anniversary Year of Fiji’s involvement in UN Peacekeeping, special attention has been paid to all the service men and women and Police and corrections officers who have served and the more than 50 who have lost their lives in the line of duty. 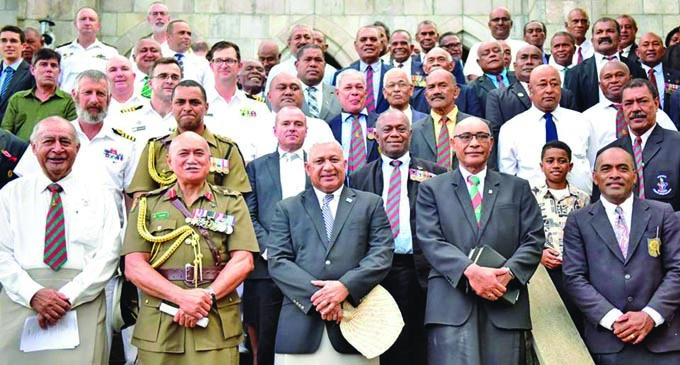 The Returned Soldiers and Ex-Servicemen’s Association’s (RSESA’s) work on the 40th Anniversary of peacekeeping revealed a little-known fact about Fiji’s first peacekeeper, and that is that he was technically a civilian. Fiji’s first peacekeeper was Mr Saula Raiyawa. Saula answered the call to duty in 1978, but his path is different to most Fijian peacekeepers who were deployed as part of RFMF units. Saula joined the RFMF in 1972. In 1977 he was in the RFMF Signal Corps and had just undertaken advanced training when the United Nations in New York requested that Fiji provide a communications technician for the Headquarters of the UN Truce Supervision Organisation (UNTSO) in Jerusalem. It may seem a lucky coincidence that the RFMF Signal Corps were undergoing this training, but in fact at that stage the Fijian government had decided that Peacekeeping would be a good way for the young nation to contribute to the maintenance of international peace and security. It also supported Fiji’s nation building aspirations. Prime Minister Ratu Sir Kamisese Mara had directed the Commander of the RFMF, Colonel Paul Manueli, to prepare to offer forces when an opportunity arose. Colonel Manueli was well aware of the challenges this would pose for the RFMF and undertook to fill gaps in capabilities, equipment and training. The RFMF Signal Corps were being trained for a possible UN mission, and their trainer, Warrant Officer Jitoko Soko was approached to select a suitable candidate to meet the UN request. Examinations had just been completed and Soko had no hesitation in recommending Saula Raiyawa. Weeks passed and then word came from the UN that they wanted Saula to deploy to Jerusalem. Recognising the gravity of the decision Colonel Manueli approached Saula, explained the situation and suggested that he take advice. Saula is from the small island of Vanuavatu in the Lau Group. He had already made a big move to Viti Levu and never imagined that he’d be moving to Jerusalem. In fact, along with most of the RFMF’s peacekeepers, he didn’t know just how far from home the Middle East was. Saula was also married and wondered what this would mean for his family. He spoke to his uncle who had served in the Malayan campaign in the 1950s and was encouraged to go to test his dedication and bravery. Joko’s signallers were ultimately deployed to Lebanon in June 1978. However, at this stage Saula was already working in the UN Headquarters in Jerusalem. In fact, Saula did the preparatory work for the United Nations Interim Force in Lebanon (UNIFIL) mission to which his brothers were deployed in June. Six months later Saula was also deployed to Lebanon, but to a UN command rather than the Fijian area of operations. Saula went onto have a distinguished career as a communications specialist and civilian staff officer. Over the following 34 years he would travel to numerous international hot spots, such as Afghanistan, Bosnia, Ethiopia, Lebanon and Pakistan. He regularly updated his specialist skills to take into account the latest developments in communications technology and was willing to deploy to where he could have an impact. In 1984 he deployed to the UN Economic Commission for Africa is Addis Ababa, Ethiopia to assist with the devastating famine. According to UN estimates the famine claimed up to a million lives, more than the population of Fiji today. Younger readers may not be familiar with this famine, but it galvanised world opinion around human security issues in a way that had never happened before. The famine accompanied civil war and Ethiopia was not the safest place to be on earth, but Saula willingly took up the challenge. Other career highlights include working with the UN Good Offices Mission in Afghanistan and Pakistan (UNGOMAP). This deployment in 1989 was to monitor the withdrawal of Soviet forces from the decade long war in Afghanistan. This was the precursor to the more recent UN operation in Afghanistan to which many Fijians subsequently served. Saula was promoted into staff work and spent the last decade of his career back in Lebanon where the journey began. Saula retired in 2012 and fondly recollects the amazing experiences he had and the opportunity that was given to him in 1978. He officially left the RFMF in 1978, while on secondment in Jerusalem, but while out of uniform he still represented Fiji as an emissary through his professional career. He took good advice from his elders and didn’t take the easy option of saying no when opportunities presented themselves. In many ways Saula is a pioneer. He was trained as one of the RFMF signallers who were the first soldiers to be deployed to Lebanon. Similarly, he was the first RFMF soldier to be seconded to the UN. He then became the first Fijian civilian working as a UN peacekeeper. Many have since followed his path. Now he is back in Fiji enjoying his retirement and reflecting on his peacekeeping experiences with brothers from the RFMF who took a very different path to the same destination. Often these discussions occur at RSESA Club in Walu Bay. RSEAS’s mandate includes all who have served on peacekeeping missions including Soldiers, Police and Corrections officers. The annual Poppy Day Appeal provides the RSESA with much needed funds to support returned servicemen and women.